Scald Protection On Ogontz Corp. The FP/FPR series valves feature a space-saving, in-line design and high/low temperature sensitivity to provide positive freeze/scald protection for emergency safety showers and eyewash stations.Freeze ProtectionThe low temperature actuated FP series provides the same basic freeze protection as the F/FG series valves, but with a straight-through flow area larger than the pipe diameter for unrestricted flow.Scald ProtectionThe reverse acting FPR series valve is actuated by temperatures in excess of 100°F due to overheating, direct sunlight or other heat source. Discharge stops when temperature drops below 90°F. Full flow to shower head is also assured. The reverse-acting FR/FGR series valve is an inexpensive way to maintain optimum discharge temperatures for more efficient and economical use of your cooling media. 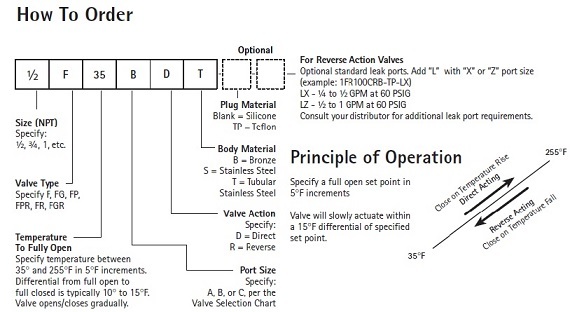 Because of its reverse action design, the valve closes when fluid temperature drops below a preset temperature — effectively eliminating the inefficient discharge of low temperature cooling fluid.Controlled leakage* can be provided through the valve for constant, true temperature monitoring. The FR/FGR series valve is an economical way to maintain optimum operating temperature of equipment for maximum efficiency.